We have voted Eden Hazard player of the year at the annual awards dinner. Cesar Azpilicueta picked up the player’s player award and Paulo Ferreira got a special award as recognition of his contribution over nine years at the club. Lewis Baker deserves special mention for picking up young player of the year and the goal of the season for his cracking back-heel volley against Arsenal U21 at the Emirates. Queens Park Rangers will contest the play-off final with Derby County after they saw off a spirited but limited Wigan with a goal in extra-time. It was Wigan’s own fault as they left Josh McEachran out of both legs. We can hardly describe our excitement at the prospect of our near neighbours returning to the top flight with their crazy ways, crazy wages and surprisingly polite supporters. Gary Cahill and Frank Lampard both made the plane to Brazil with England as expected. Christian Atsu made the Ghana squad. The youngster has been on loan at Vitesse and should feature in the finals. While, for old time’s sake, Michael Essien made the cut too. West Brom and Brighton are looking for new bosses after Pepe Mel and Oscar Garcia both left today. John Terry has signed a contract extension for next season. He will be heading towards 650 appearances if he stays fit next term. Torres and Azpilicueta are going to Brazil with Spain and Eden, Romelu, Thibaut and possibly Thorgan are going with Belgium. Sky Sports seem convinced that we have secured Diego Costa for £32m but obviously nothing is confirmed. Phil Scolari is facing court in Portugal over unpaid tax. It appears more than just an attempt to unsettle Brazil ahead of the World Cup as it involves image rights payments and offshore banks. Chaotic Tottenham sack another manager as Tim Sherwood discovered that Spurs expect Uefa League football every season. Having given up home advantage for the second match in a row the U21 side secured the double after lifting the FA Youth Cup they completely outplayed United to secure the U21 league crown. Manchester United allowed their fans in for free to generate a crowd and 12,000 responded, they sang, they chanted, they sloped off home early to miss Chelsea lifting the trophy. They actually had a goal to cheer as United’s only decent move of the first-half saw Tom Lawrence side-step a challenge to fire home. 1-0. From that moment on we rarely looked threatened as the spine of Jamal Blackman, Andreas Christensen, Nathan Ake, Ruben Loftus-Cheek and Lewis Baker ruled the pitch. Our equaliser was another great strike from Charly Musonda who cut in off his wing to tuck the ball back across the ’keeper. 1-1. The second-half was much like the first as we dominated possession and chances before Lewis Baker saw his chance, chasing down a looped clearance he latched on to Islam Feruz’s lay-off and curled his shot in at the far post with goalkeeper stranded. 1-2. After a busy season of close but for the first-team, it was nice for the academy to remind the club that they had all the cigars. Meanwhile, one Chelsea player has a European medal as Marko Marin and Sevilla beat poor Benfica. Bela Guttmann cursed Benfica 52-years ago now for not awarding him a pay rise. We should be thankful that Eddie McCreadie only asked for a company car. Marko was a second-half sub but was only on for a few minutes before a muscle injury forced him off again. Friendlies. Wycombe and AFC Wimbledon on 16 July and Saturday 19 mean we can all get to the games without flying or crossing the international dateline. Both friendlies will feature a blend of youth and experience as the World Cup players rest for a while. Manchester City have accepted Uefa fair play sanctions limiting the size of their Champions League squad to 21. Paris Saint-Germain were among the other clubs sanctioned. City have been whining about how unfair it all is but spending close to £100m more than the rules allow was always going to be a problem. Sadly the £49m fine does not come directly out of their spending for next season but they are limited in spending and the size of their wage bill. Thibaut Courtois and Atlético secured a draw in the Camp Nou and with it the Spanish league title. Only a handful of Atlético fans could get tickets but the whole of the Camp Nou stood an applauded at the final whistle. Barça fans are noble indeed. 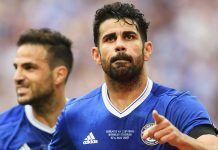 Diego Costa, often linked in the press to a move to SW6, limped out of the match with a recurrence of a hamstring problem. A loud creak was heard in north London as a hitherto little used trophy cabinet was opened for the first time in nearly a decade. Hull City put on a magnificent show by taking Arsenal to extra-time but they couldn’t force penalties as the Gooners won the cup 3-2. Over in Germany München had to settle for a domestic double as the won the DFB-Pokal. Patrick van Aanholt came on in the second-half at the Netherlands drew 1-1 with Ecuador. Back in west London, Roy Bentley is 90 today. Captain, goal scorer and all round good guy Roy has been part of the DNA of this football club since before most of us were born. He deserves the all the love, respect and loyalty we can show him. Happy birthday Roy. Juventus set a points record by winning Serie A with 102 points. The whole season has been a bit of a cakewalk for the Turin side. Until, that is, they had to watch Sevilla winning the Uefa cup on their own pitch last week. Cambridge United will play league football again next season after they beat Gateshead, and former Blues academy graduate Carl Magnay at Wembley in the Skrill play-off by two goals to one.